Invented in 1801, Jacquard looms are really an add-on to already existent mechanical loom systems, which allowed those looms to create patterns more complex and intricate than anything that had been done before. The difference: Punch cards. When you weave, the pattern comes from changes in thread position — which threads were exposed on the surface of the cloth and which were not. But prior to the Jacquard loom, there were only so many threads that any weaver could control at one time, so patterns were simple and blocky. Essentially, the Jacquard system vastly increased the pixels available in any weaving pattern, by automatically controlling lots and lots of threads all at once. Punch cards told the machine which threads were in play at any given time. It's a really cool process, and I wanted to share a couple of videos that give you a good idea of how these looms work and how they changed the textiles industry. You can watch them below. But probably the best example is the image above. 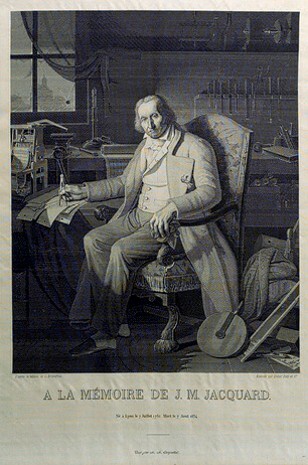 It's a picture of Joseph-Marie Jacquard, woven in silk on the loom he invented — a fantastic demonstration of the design power that loom offered. In just a few years, people went from weaving simple stars and knots, to weaving patterns that almost look like they were spit out of a printer.